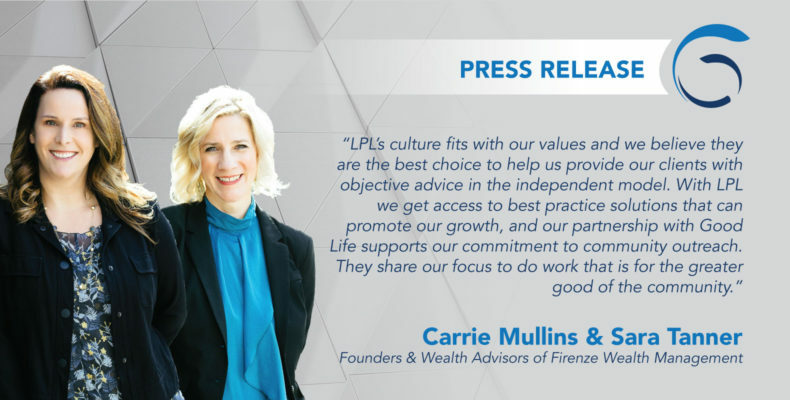 READING, PA — April 1, 2019 — Good Life announces a new partnership with Firenze Wealth Management, a Portland, OR-based private practice with over 50 years of combined experience in the industry. Founders Carrie Mullins and Sara Tanner lead the team, which was previously with Foresters Financial. They bring with them three Advisors: Susan Perry, Sierra SwiDrak, and Davis Siliga, one Financial Representative: Kalin Rooney, and five Client Care Specialists: Steven Mahoney, Zia Mareck, Annie Holcombe, Ellie Higbee and Miranda Olson. The advisors at Firenze reported that they managed approximately $390 million of client brokerage, advisory and retirement plan assets*. Firenze was hatched during a trip to Florence, Italy in 2017, as the women became inspired by the multifaceted insights that influenced the Renaissance. They take a similar approach to financial guidance, offering holistic financial planning and wealth management services with a focus on education in serving their clients. To reach Firenze Wealth Management, please call (503) 963-6555. *Based on prior business and represents assets that would have been custodied at LPL Financial, rather than third-party custodians. Reported assets and client numbers have not been independently and fully verified by LPL Financial. Good Life Companies is a result of the culmination of a small group of Financial Advisors that came together to create a platform and culture for other Financial Advisors that are also in the pursuit of their own vision of the Good Life.